A total of 47 Orang Asli activists have been remanded for investigations into their anti-logging blockade in the interiors of Gua Musang, Kelantan. Berita Harian reported that 17 of them were slapped with three-day remand orders today, while the others were remanded for two days. The remand orders were granted by magistrate Mohd Faiz Omar at the Magistrate Court in Gua Musang, the daily reported. The group aged 18 to 40 were arrested after police and the Forestry Department destroyed their blockade at Pos Petei and Pos Bihai yesterday afternoon. The blockade was set up since September to stop logging at the Balah forest reserve. The remand application was made by the Kelantan Forestry Department under Section 32, Section 47 and Section 81 of the Forest (Amendment) Enactment 1984 for allegedly trespassing and staying in a forest reserve without permission. Berita Harian said the seven-hour operation involved 210 enforcement personnel. Bamboo huts built by the activists at the blockade were also destroyed, it reported. 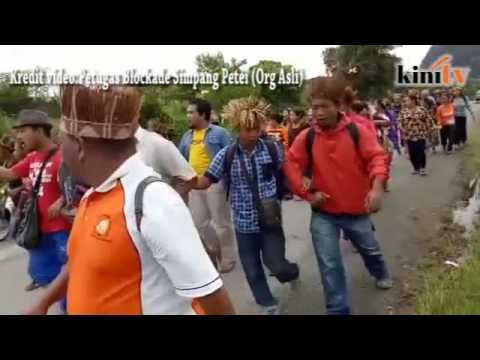 The Temiar Orang Asli community marched to the courthouse this morning in solidarity with those arrested. However, not all in the Gua Musang Orang Asli community support the blockade. Some say that while they oppose environmental destruction, they believed the confrontational method of protest is not the Orang Asli way.